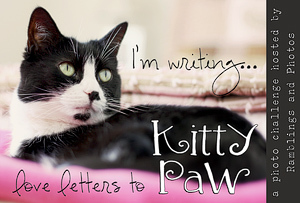 Ashley is hosting a “Love letters to Kitty Paw” Photo Challenge! It ends tonight. Here is the valentine to Kitty Paw… Love, Peter. He's pretty cute for an old guy, isn't he? I love him. He's my favourite cat in the world. so cute. i wonder how kitty paw will feel about it? He is very cute...and what a personality!